From Gray-on-the- Saône we sailed back to Dole, because we would be meeting family there. As we waited for them we spent a lovely week there, beneath a monumental church, so no complaints about the view. While we were there a whole day long there was a triatlon for different categories, small and big. During the summer we are roaming, but part of a small community of people who live likewise. Part of the fun is that you never know if and whom you’ll run into around the bend. Sometimes it’s a really big surprise; in Dole we moored for a few days next to friends of ours who were there already with their ship Dagens II. So we keep friendships alive. On their boat I learned to felt, something I had wonted to do for a long time. The neighbour sent me home with a bag full material to go on, a winter activity I look forward to. 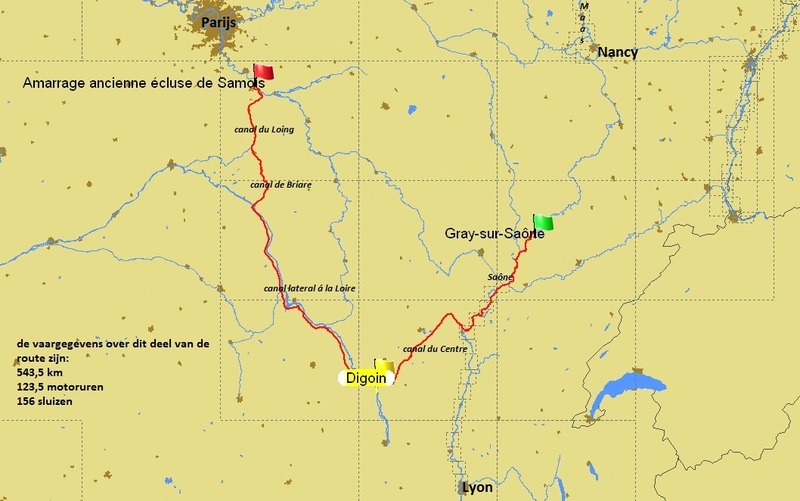 We had about 100 K ahead on the river Saône and after that some 219 K of canal, including 62 locks (up) and 47 (down); in other words crossing a mountain. Our problem now was not so much getting in a time squeeze, but we ran the risk of a closure of the canal. We had received some information about an imminent closure – it was already closed for ships with a water draught over 1,2M - and we wanted to be in that canal before that. We figured ‘they’ would not close it on us, so once we were in we could get through (turning is not a good option, given our length). On arrival they didn’t even ask after our depth and everything seemed okay. Not really so, as we were bothered by low water levels. When cruising we had to stick to the centre line – sufficient depth – and mooring was most of the time out of the question as we couldn’t get to the shore. Only a limited amount of proper moorings were available. The day after we got out of the canal they closed it down, we were the last big ship to have gone over the top, the summit was closed now in both directions. There was though one advantage. As from the start of our itinerary we knew that here we had to navigate our lowest passage where we could pass, but there was no margin, so we hoped for no foul-ups. Well, as can be seen from the picture we had, due to the water level, lots of margin. On the Saône there were a few locks with a kind of rear view mirror, placed there for the benefit of the lock keepers, in the olden days. It gives you a nice pic of your own boat in a lock which we rarely see as we are always on board. Just like the other photo that I could make from the lock doors because the distance between locks there is so small that I could walk ahead. Here you can see the water swirling round the ship as the lock is filled. Sometimes so forceful that the ship rocks against the walls. In this canal there is a tunnel with an entrance so narrow and curvy, it is just knowing that the so much bigger peniches have passed before us that gives us the courage to go forward. It always looks narrower and smaller than it really is. In the olden days this canal was used by cargo carrying peniches, but they are gone; now it’s just pleasure craft. The disappearance of commercial shipping from the smaller canals of course has its repercussions for the villages along the canals. The dilapidated buildings carry witness. Although it is a sad thought and a bleak view, some buildings are beautiful, even when decayed. In the Netherlands a dilapidated factory would have been demolished but here – luckily – it is allowed to stay. Meanwhile September had begun, the days had shortened, evenings were chilly. We heard and saw more trees being cut and the wood piles were built up. Preparations for winter that were not foremost in our mind. We had just left the ‘canicule’ (heat wave) behind us. Along the way we meet all kinds of boats, some of which really stick out, where the owners have done their best to build a one-of-a-kind, sometimes very ingeniously like this one. An old ferry where the owners roll on their caravan and go cruising, home-aboard. When they are done cruising they go and pick up their car and hitch the caravan, thus mixing cruising and driving. Panache had developed a curious habit this summer, we haven’t a clue as to why (heat stroke?) or how but he became so obsessed that it became worrying. Both during cruising and when moored he stood like a statue, just over the exhaust, staring at the water and he wouldn’t budge. Even when walking ashore he returned like a shot, when given the chance, to stand there. In the end we blocked that particular spot so at least he was not hanging over the fumes. It is better now, but still peculiar. After the Canal des Vosges we went via Toul to the Canal de Meuse, the first leg of the Meuse river. Here the low water levels still bothered us, but less and less and it was over as we finally entered the river proper. We still were cruising a part of France we didn’t know, so we came to new – to us, that is – towns like Sedan and Verdun. Sedan houses the biggest castle of Europe, very imposing. We had already heard many stories about Verdun, as WWI had a huge impact on this region and left its mark. The memories are still very much visible. We made a tour on our scooter of these monuments and found it very impressive. Goose pimples when you’re standing next to the domes, where they housed the cannon, looking at the beautiful sloping hills. First we had been underneath this dome where it was visible how the soldiers had their bivouac there, how senseless parties fought each other and how bomb shelled and desolate the landscape had looked then. Although we had been bothered by low water levels, there’s been many a period when the levels were so high that the consequences have been dire. On a lock on the Meuse they visualised how high up the levels have been in the past; looking at it you can imagine the problems that were caused for the area. 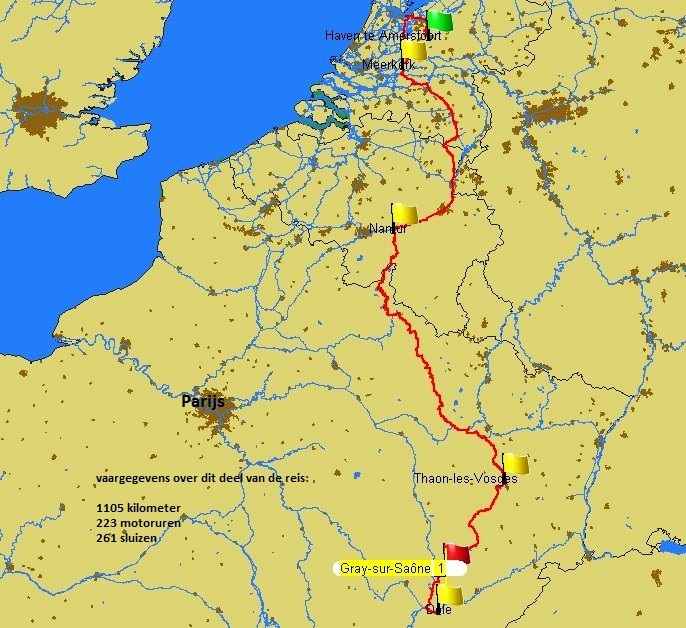 We had planned to stop for a few days in Fumay, just short of the French-Belgium border. Here we were back on known territory and we knew there is a nice quay where you can do a bit of work. And you can shop, last stop in France, and use up the French internet data. On arrival it turned out we were not the only ones that had had these thoughts and we found a few bigger boats there, all people we knew. It looked like an impromptu rally and this is what it looked like. As we had done this stretch of the Meuse before, the view was not so much a surprise any more, but cruising underneath these huge slabs of rock is still very imposing, quite a change from the scenery we had seen previous months. We were surprised, though, when we found that the sunken ship in the Meuse was still there, as it was a few years ago; do they imagine it to be a tourist sight? Just south of Dinant you sail underneath the Charlemagne highway; spotting a busy carriageway up there makes you aware that cruising is done in a different world. During a short stay in Namur our grandson came to visit us with his parents, a real joy to see him (well, all three actually :-)) after so many months. Just before the Belgian-Dutch border we were boarded by the Belgian police to check our paperwork and such. They do that regularly, we had been told by fellow skippers, but we had not ever been checked in the previous years, which surprised even these coppers. They had been following us for a while when they raised us on VHF telling us to take them aboard, so surely they must have noticed Michel at the wheel. As he had to get the necessary documents I took over the helm, we could just continue during the check. Part of that was me having to blow a breath analyzer as I was at the helm, it showed I was sober at eleven am, but they will never know if Michel would have been over the limits :-), weird. I kind of liked it as I had never done such a test before. We spent a few days in Maastricht, because of being late in the season and the bad weather there was plenty of room on the quay (mostly it is crowded) just as la Tulipe had, so it turned out to be a social visit as well. But then we had to move on as we still had some special activities ahead before we could moor in Amersfoort. First we had guests on board in Den Bosch, Australian friends on their way from their boat to the next summer down-under, before they return again for our summer. And then we were off to Meerkerk for a rally. Meerkerk at Anchor, organised by our friends from Shell V. A rally with 8 boats and 17 people in all. The weather was gorgeous and we spent three very nice days with old friends and made a few new ones. Having dinner together, going for a walk together, a real Jeu de Boules competition on the track in front of the local super. a panoramic view of all participants in the Merwede canal. And on again, at a steady pace to Amsterdam for a very special event. On October 5th my oldest brother got married there and, after the wedding ceremony, we made a trip through Amsterdam; all went well and everybody enjoyed it. Our bonus was steering ‘t Majeur right through Amsterdam, mooring in front of the Carré theatre which was a first. We had a fantastic cruising season and have been able to enjoy it without problems. We enjoyed the well known tracks and lots of new ones, the social gatherings, both planned and spontaneous, and we had perfect weather. Below is a graph indicating levels where you can see we did some heights. The top was in the Canal de Vosges (390 meters over the Amersfoort level), and after that a quick descent on the Meuse to Dutch levels. Now we are back in Amersfoort and are moored on the old spot for a few months ahead. We like it this way and look forward to all activities linked to this period, not least the time we will spend with this happy little chap and we’re looking forward to meeting our second grandchild in February. Meanwhile no cruising and no blog, but I now already know that the March itch will come and we will leave here in April; and also next season I’ll try to write a blog. For now, greetings to all my readers, hope to meet next year. In the years prior to buying ‘t Majeur we once made the trip from Mulhouse to Dole with other people, we hired a boat on the Nivernais and were part-owners of a boat on which we also cruised the Nivernais. Since then cruising these regions in middle France were high on our list. For various reasons we have cruised other parts of France in the last few years, much to our pleasure. Last year we wanted to ‘do’ Burgundy but the broken down bow thruster prevented that. So we were really looking forward to the moment we could go from the Seine into the Canal de Loing and we were more than happy making our first stop in Moret-sur-Loing, it was just what we hoped for (and expected). After crowded Paris and cruising the Seine it was good to be on the calm canals and especially the small villages. In many canals locks are automated or you’re provided with a remote control to operate the locks or you have to twist a pole, but here locks are still manually operated. So, it’s plain politeness to help where possible and, as Michel is on the helm, this task befalls me; it is good exercise and always an opportunity for a chat with the lock keeper who does the other door so it’s improving my French. Before one of the locks we had to wait a long time because it filled on the other side that had to be locked first. It really took a while and we saw smoke emerging from the lock. We first thought it was a fire, but the photographer on the bridge kept his cool, alternatively taking pictures of what was happening in the lock and then of us. The riddle was solved when the doors opened and three very small steamboats emerged. Billowing smoke and hooting they passed us, as interested in us as we were in them. Although we never visit a church in Holland it’s become a custom of ours to make a tour around the church in French villages – by then you have seen most of the village as well – and to have a peek inside. What was new after all these years was a bicycle in the church. The lady ministering the flowers wanted to make sure and knowing the Lord sees all, also when they take my bike, the least I can do to help him is by taking it inside. On our route there are two monuments of interest, Rogny les sept écluses (Rogny of the seven locks) and the pont-canal de Briare, both on the world heritage list. The seven locks of Rogny date from 4 centuries ago, connecting the Loire and the Seine. Two rivers, flowing in separate valleys, separated by a mountain ridge. Thanks to this lock-staircase boats could muster a height difference of 25 meters. In 1604 a new design, 7 locks end-to-end with brick walls. It saved on doors (8 instead of 14), the locks could be shorter, the walls lower, so ‘easier’ to build, and the walls interconnecting made it sturdier. When, in 1608, it was almost finished things took a turn for the worse: wars, vandalism, lack of funds, quarrels and what more so it wasn’t finished till 1635. The locks worked until 1880, but by then they were too small for the standard boat sizes then in use, they needed too much water – more than available – so they were replaced by 6 locks in a diversion. What remains are the stones - doors and so are long gone - in the middle of the fields as a beacon and symbol of yesteryears boating. The second monument we were looking ahead to, still in use, was the pont Canal de Briare. Over the past years we have cruised many pont canals, but none as long (662 meters), as beautiful and as well known. This pont canal – opened in 1896 – connects the banks of the river Loire, an enormous improvement for bargees who until then had to cross on the Loire itself, often dangerous, and – when currents and queues were against you – it could take up to 8 hours, to just to manage an 800 meter stretch from the one lock to the other. And besides, it is a beautiful structure with pretty lampposts, and Gustave Eiffel was involved, in building the structure under the bridge and the lamposts and pillars on top. Close to Briare is Gien, although situated on the Loire it is on a non navigable stretch, but within cycling distance. They sell uncannily expensive earthenware and even in the hall, next to the factory where they sell out-of-date designs and B-choice, prices are staggering. Thirty years ago it was less bad and I bought a set of tea cups; we were camping nearby then. I have visited here once or twice again over the years, but it was high on my list to go there again when barging. We did, prices had gone up again and I restricted myself to replacing two broken teacups. Not to be repeated, but it can be ticked off. Cruising these canals you know that you can only go forward, turning is no option and the canals and rivers that you cross are not navigable. 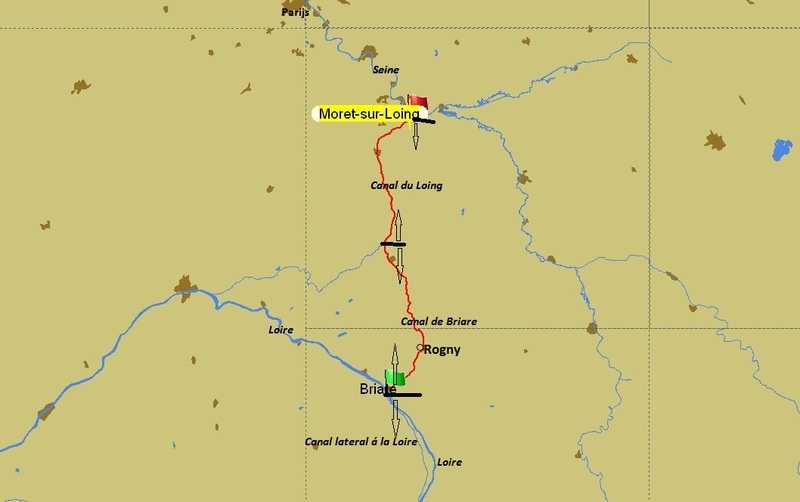 So we knew for sure that we would meet the friends, that were skippering from the southern most point of the canal lateral à la Loire, going North. Neither of us could go elsewhere. So it was no surprise, but surely pleasant to meet before we both went our ways. That is one of life’s nicer aspects, sometimes you know you’re going to meet people you know but often it is a coincidence. But always a good reason for a get together before you’re on your way again and can possibly run into someone you know just around the corner, or meet no-one for weeks. Past Briare the Canal runs alongside the Loire, sometimes close, sometimes a bit further away. The area between canal and river is a bit marshy, densely grown over and with lots of birds. There are many trees along the canal which was nice as we could do with a bit of shadow, temperatures having risen considerably. As of the beginning of July there was officially a heat wave, temperatures up to 350C (660F), and luckily on the water it bothers you less, but warm it was and it lasted for three weeks. We were in the middle of the Loire region and here you can see lots of pretty castles and manors, pleasing to the eye, and then, as you turn a corner, you spot the cooling towers of a nuclear power plant, billowing water damp and not really an asset – to the landscape. Shopping has to be done when you can, especially for the heavier stuff it’s nice if the shops are nearby. In this parts it is seldom a problem, there are shops aplenty, we have seen worse. DIY shops though are different, they are meant for visits by cars and preferably on the other side of town. A bit bothersome, so if there is a DIY shop next to the canal we happily visit it. And having two spud poles makes mooring easy on a otherwise impossible mooring along a busy road. In la Charité sur Loire there was but one mooring available, the loading bay of the grain silo which was no problem as there was no barge expected for a few days. When I came back from a walk it just looked like we were being loaded; that’s how it must have looked like in the olden days when ‘t Majeur, then WUTA, was carrying pebbles between Maasbracht and Mechelen. As we made a cycling tour near Nevers we spotted – from a vantage point - a nice looking stone pont canal, this one across the river Allier, a tributary of the Loire. As we went across there appeared a canoe behind us with a Swiss couple. 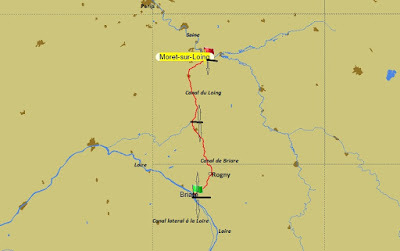 They had taken their foldable canoe to here by train, had come down the Allier and now they had schlepped their canoe up to the pont canal; they wanted to go to Nevers via the canal and then to the Loire, all their stuff in the canoe. Quite an enterprise but they loved it. After the Canal latéral à la Loire we continued on the Canal du Centre, with open banks, warmer but with beautiful views. Meanwhile the farmers were eagerly working their land and all bales of hay had to be taken in. Mostly they are those big round bales, but this farmer had square ones and seeing this coupled with seeing the tractor, heaving another bale on top of others, reminded me of how my kid brother used to play with toy cars and little blocks. It was still very hot, the cows felt it too and you could see them lying under the trees in little groups of on their feet in the canal. This one cow had a pole position and looked for cooling underneath a tree, a one-cow-position and the rest on land. From the Canal de Centre we moved onto the Saône, a very pretty, broad river. As nice as it had been to go from the Seine onto the canals, we loved going back to the wider waters, doing a bit more than 6 k/h and a real change of scenery. And, nice mooring positions for to stay a few days. And here again a pre-arranged meeting with other bargees, who coerced us to go swimming, like they did. In the canals I had not taken to it but on these wider waters it was lovely to take a refreshing dip several times a day. Even Michel and Panache found swimming to be nice when it’s warm. Meanwhile we cruised as far as Gray and from there – reversing - to Dole. From there it’s back to Gray and then further North, more about which in the next episode.